1. 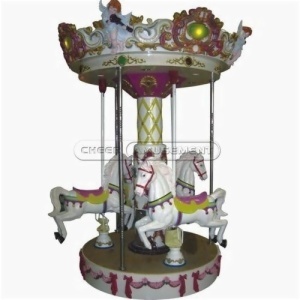 It is an electronic coin merry-go-round, coin, small children can sit immediately slow rotation, suitable for young children to play. 2. The product is low cost product, the biggest cost saving for you, bring you the biggest investment interests. 3. The product has three rotating pony, fixed by steel tube respectively, and increased the stability of the product, safety without harm. 4. The products have different color and theme for you to choose, and colorful appearance will be more attractive to the children's eyes.